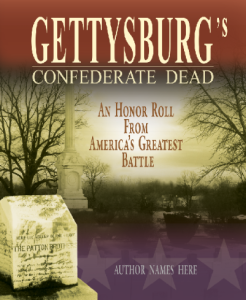 I just finished editing Gettysburg’s Confederate Dead: An Honor Roll from America’s Greatest Battle by Robert K. Krick and Chris L. Ferguson. All I can do is shake my head and say “Wow!” I say this not only because of the incredible research counted by endless painstaking hours but more importantly by the misery and sorrow encapsulated by each soldiers’ name on this roster. This book includes the most accurate list ever compiled of Gettysburg’s Southern dead. Each soldier is listed by name, rank & company & regiment, date of birth, date of death, brief personal info, and burial spot. There are 5006 names on the list which adds up to 30,036 line entries. This represents a huge amount of work for veteran historians Krick and Ferguson. Those familiar with the Civil War field will certainly recognize Bob K. Krick’s name as he is an expert on Lee’s Army of Northern Virginia and he retired as the National Park Service’s chief historian for Fredericksburg & Spotsylvania National Military Park. He has written numerous excellent books which include Stonewall Jackson at Cedar Mountain  and Conquering the Valley . Chris Ferguson is widely regarded as an expert on Confederate military records and he has writtenHollywood Cemetery: Her Forgotten Soldiers  and Southerners at Rest: Confederate Dead at Hollywood Cemetery . During the first week of June 1863, Robert E. Lee’s army, numbering nearly 80,000 veterans, began to move toward the Shenandoah Valley to use it as a conduit to invade Maryland and Pennsylvania. While on the march, how many of these men thought that this might be their last campaign? Probably all of them. What would the 3rd Georgia’s Edward Aaron have done if he knew that he would be the first on this alphabetical list of death from Gettysburg? Or the three Almands – John, Reuben and William – all from Cobb’s Georgia Legion and all possibly brothers. What became of the body of the 34thNorth Carolina’s major George McIntosh Clark? He was killed in action and buried in front of Gettysburg College but the body has never been found. Is it still there or has it been pushed around by a bulldozer blade and perhaps re-landscaped into an athletic field? Then I drop three more lines down from Major Clark’s listing and I come to twenty-one-year-old Jonathan Clark. This young man served in the 42nd Mississippi and he fell on July 1. His father, forty-eight-year-old Captain Thomas Goode Clark, also fell nearby. Their bodies never made it into any marked grave. I cannot imagine the grief that Mrs. Clark must have felt when this news traveled back to Mississippi.